Production: Decla-Bioscop-Ufa Studios (Decla-Bioscop and Ufa merged during production); black and white, 35mm; silent; Part I: Siegfried; length: 3216 meters originally; released 14 February 1924; Part II: Kriemhilds Rache (Kriemhild's Revenge); length: 3576 meters; released 26 April 1924. Both parts were combined in a shortened version of 2743 meters, with music from Wagner's Der Ring des Nibelungen as arranged by Hugo Reisenfeld, released in 1925. Part I released in 1933 in a 688-meter version under the title Siegfrieds Tod . Parts 1 and 2 filmed simultaneously between 1922–1924 in Decla-Bioscop-Ufa Studios in Berlin. 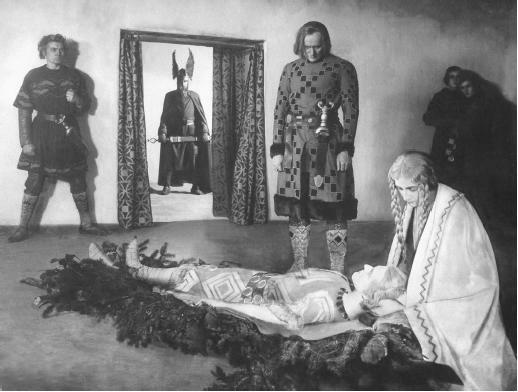 Screenplay: Thea von Harbou and Fritz Lang, from the opera Das Nibelungenlied by Richard Wagner and from Norse sagas; photography: Carl Hoffman and Günther Rittau, with Walter Ruttman ("Dream of the Falcon" sequence); art directors: Otto Hunte, Erich Kettelhut, and Karl Vollbrecht; music: Gottfried Huppertz; costume designers: Paul Gerd Guderian (who died during production) and Anne Willkomm; armor and weapons: Heinrich Umlauff. Cast: Paul Richter ( Siegfried ); Margarethe Schön ( Kriemhild ); Theodor Loos ( King Gunther ); Hanna Ralph ( Brunhild ); Georg John ( Mime, the Smith , and Alberich ); Gertrud Arnold ( Queen Ute ); Hans Carl Müller ( Gerenot ); Erwin Biswanger ( Giselher ); Bernhard Goetske ( Volker von Alzey ); Hans Adalbert Schlettow ( Hagen Tronje ); Rudolf Rittner ( Markgraf Rüdiger von Bechlarn ); Hardy von Francois ( Dankwart ); Fritz Alberti ( Dietrich von Bern ); Georg August Koch ( Hildebrand ); Rudolph Klein-Rogge ( King Etzel ); Hubert Heinrich ( Werbel ); Grete Berger ( Hun ); Frida Richard ( Lecturer ); Georg Jurowski ( Priest ); Iris Roberts ( Page ); Rose Lichtenstein. Von Harbou, Thea, Das Nibelungenbuch , Berlin, 1923. Weinberg, Herman, An Index to the Creative Work of Fritz Lang , London, 1946. Pensen, Paul, The Cinema of Fritz Lang , New York, 1969. Armour, Robert A., Fritz Lang , Boston, 1978. Ott, Frederick, The Films of Fritz Lang , Secaucus, New Jersey, 1979. Wirwalski, Andreas, Wie macht man einen Regenbogen? : Fritz Langs Nibelungenfilm: Fragen zur Bildhaftigkeit des Films und seiner Rezeption , Frankfurt, 1994. Bogdanovich, Peter, Who the Devil Made It: Conversations with Robert Aldrich, George Cukor, Allan Dwan, Howard Hawks, Alfred Hitchcock, Chuck Jones, Fritz Lang, Joseph H. Lewis, Sidney Lumet, Leo McCarey, Otto Preminger, Don Siegel, Josef von Sternberg, Frank Tashlin, Edgar G. Ulmer, Raoul Walsh , New York, 1997. Levin, David J., Richard Wagner, Fritz Lang, and the Nibelungen: The Dramaturgy of Disavowal , Princeton, 1998. Gunning, Tom, The Films of Fritz Lang: Modernity, Crime, and Desire , London, 2000. Minden, Michael, and Holger Bachmann, editors, Fritz Lang's "Metropolis": Cinematic Views of Technology and Fear , Rochester, 2000. Berliner Tageblatt , 15 February 1924. Ybarra, T. R., in New York Times , 29 April 1924. Berliner Tageblatt , 2 May 1924. Hardt, Romey, in Kritiker (Berlin), May-June 1924. Barry, Iris, in Spectator (London), 14 June 1924. Hall, Mordaunt, in New York Times , 24 August 1925. "How Siegfried Was Produced," in New York Times , 6 September 1925. Krutch, Joseph Wood, in Nation (New York), 16 September 1925. Fraenkel, Heinrich, "The Story of Fritz Lang, Maker of Siegfried ," in Motion Picture Classic (New York), March 1926. New York Times , 16 October 1928. New Republic (New York), 13 August 1930. Gesek, Ludwig, "Fritz Lang: Suggestion und Stimmung," in Gestalter der Filmkunst, Von Asta Nielsen bis Walt Disney , Vienna, 1948. Manvell, Roger, "Siegfried 1922–1924," in Sight and Sound (London), April 1950. Granich, Tom, "Fritz Lang," in Ferrania (Milan), August 1950. Truffaut, François, "La Cinquième victime," in Arts (Paris), 22–24 August 1956. Luft, Herbert G., "Erich Pommer," in Films in Review (New York), November 1959. Berg, Gretchen, "La Nuit viennoise: Une Confession de Fritz Lang," in Cahiers du Cinéma (Paris), August 1965 and June 1966. Rhode, Eric, "Fritz Lang (The German Period 1919–1933)," in Tower of Babel , London, 1966. Oudart, Jean Pierre, "La Sature," in Cahiers du Cinéma (Paris), April and May 1969. Barsacq, Léon, "Toward a Film Aesthetic: Sweden and Germany 1917–1922," in Le Décor de film , Paris, 1970. "Selbstdarstellung: Fritz Lang," in Frankfurter Rundschau , 15 May 1971. Phillips, Gene D., "Fritz Lang: An Interview," in Focus on Film (London), Spring 1975. Jouvert, P., "Les Images de Kriemhild," in Cinématographe (Paris), January 1977. Stiles, V. M., "The Siegfried Legend and the Silent Screens: Fritz Lang's Interpretation of a Hero Saga," in Literature/Film Quarterly (Salisbury, Maryland), no. 4, 1980. Lorenzen, Dagmar, and Ulrike Weinitschke, in Cahiers de la Cinémathèque (Perpignan), Summer 1985. Kramer, S. P., "Fritz Lang's Definitive Siegfried and Its Versions," in Literature/Film Quarterly (Salisbury, Maryland), October 1985. Hake, S., "Architectural Hi/Stories: Fritz Lang and The Nibelungs ," in Wide Angle (Baltimore), no. 3, 1990. Esser, M., "Rooms of Felicity," in Filmbulletin (Winterthur, Switzerland), no. 5, 1990. Hauer, Stanley R., "The Sources of Fritz Lang's Die Nibelungen ," in Literature/Film Quarterly (Salisbury), vol. 18, no. 2, 1990; "Additions and Corrections," in vol. 18, no. 4, 1990. DeBartolo, J., "Video Tape Reviews," in Classic Images (Muscatine), no. 235, January 1995. The filming of a national epic was a large undertaking even for Fritz Lang. Die Nibelungen emerged as a masterpiece of design based on a script by the talented Thea von Harbou, Lang's wife. It was an architectural concept from beginning to end (Lang himself had been an architect), and it was a triumph of studio craftsmanship at which the Germans excelled. The castles, the forests, the brooks and caverns were all studio-made. The story fell naturally into two parts: the love of Siegfried and Kriemhild ending in his death and the vengeance of Kriemhild wreaking destruction on her husband's murderers; to this end she gives herself to the barbarian Attila and uses her power to destroy her brothers and the sinister Hagen Tronje. The essential drama of the film lies in the contrast between the stately formal beauty of the first part and the desolate and arid lovelessness of part two. The formal patterns, magnificent though they are, exclude dynamic development, and the progress of the film is slow and static. The Soviet critic Vladimir Nilsson faults the film on these grounds. In Part 2, however, the revenge of Kriemhild hastens the pace until the final holocaust. The version of the saga used by Lang is very different from that used by Wagner. It is concerned less with Gods and more with human beings. In their symmetrical patterned costumes Lang's people are still human; the world of magic which he evokes does not diminish them. Without any tricks of editing or visual fireworks, Lang approaches his subject with sober observation. It is nevertheless a magic world. The tall stately trees of the forest, the flower-laden banks of streams, the great steps of the cathedral, the drawbridges high in the air, the armour of the knights are all part of a world designed by Lang and his architect, Kettelhut. Scene after scene is memorably beautiful: the fight with the dragon; the flaming fortress of Brunhilde; the great cathedral of Worms. The acting is strong and firm with a finely contrasted performance by Margarethe Schön as Kriemhild, the gentle lover who becomes the half-demented fury. In the final catastrophe, as the crazed widow of Siegfried sways in front of the blazing hostel, one thinks of the fanatical woman outside the burning jail in Lang's first American film, Fury . The theme of the dual nature of woman is a recurring one with Lang to which he returns in Metropolis in which Maria and the Robot represent the forces of love and destructiveness. It is interesting to compare this early film with John Boorman's Excalibur (1981), because they have so many elements in common. But the tautness of Lang's structure gains over the looser and more diffused film by Boorman. Die Nibelungen is a film without offspring, a beautiful pageant by a master, to be admired and enjoyed for its own sake.